PLEASE BE AWARE IN ORDER TO PURCHASE THE CLASSES YOU MUST FIRST REGISTER AS A MEMBER OR REGISTER TO PURCHASE ONLINE. IF YOU HAVE ALREADY REGISTERED YOU MUST LOG IN TO YOUR PREVIOUS ACCOUNT. 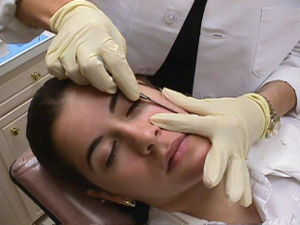 Dermaplaning, also known as epi-leveling, was first used by doctors in the 1990′s as an exfoliation treatment instead of using acid peels. 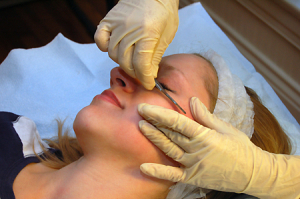 Dermaplaning provides an alternative to peels or microdermabrasion and is a good choice for anyone who has fine facial hair, extremely sensitive skin, redness or rosacea, or telangiectasia. The treatment is performed using a surgical blade to gently exfoliate dead skin cells in the Stratum Corneum and removes the vellus hair, commonly known as “peach fuzz”, which can trap excess dirt and oil. A noticeable improvement is immediate with smoother texture and fresh skin appearance. Hair returns softly and will not become coarser due to this treatment. To register for this class see below. To register for this class click on “ticket” below and reserve your seat.